Demonstrating its commitment to ‘leave no one behind’, the Government of Tuvalu has completed and launched the country’s first comprehensive national study on persons with a disability. ‘The launch of the Disability Study is a stepping stone for Fusi Alofa Association and its members and it highlights the need to urgently provide for the needs of people with disabilities in Tuvalu,’ said Mr Melton Paka Tauetia, General Manager of Fusi Alofa Association. The report was launched by Honourable Neemia, with formalities including speeches from Ms Christina Munzer of Australia’s Department of Foreign Affairs and Trade (DFAT) and Mr Tauetia of Fusi Alofa Association. Back row – left to right: Hon Mackenzie Kiritome (Acting Minister of Foreign Affairs Trade, Tourism, Environment and Labour); Hon Isaia Taape (Member of Parliament); Hon Namoliki Sualiki Nemia (Minister of Home Affairs and Rural Development); Hon Maatia Toafa (Deputy Prime Minister and Minister of Finance and Economic Development); Ms Christina Munzer (DFAT Counsellor, Development Cooperation); and Mr Monise Laafai (Minister of Transports and Communications). Front row: Mr Taupaka Uatea, President of the Fusi Alofa Association. The launch also featured members of the Fusi Alofa Association performing humorous skits that focused on the topics of accessibility and people with disabilities having families. ‘We can see the challenges faced and we can use it to improve services and to enable us to work with Fusi Alofa Association and to understand poverty and gender in relation to disability,’ said Ms Lupe Tavita, Acting Director Department of Community Affairs in the Ministry of Home Affairs. The study team was led by short-term technical adviser Helen Tavola. With the study completed, the government will use the report and the recommendations to guide policy development and initiatives that support the improvement of the lives of people with disability, including providing financial support to Fusi Alofa Association. 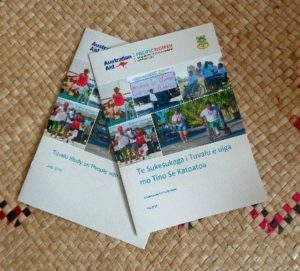 The Executive Summary of the report, translated by lead fieldworker and former country focal point of the Secretariat of the Pacific Community’s Regional Rights Resource Team Ms Eseta Lauti, will be also disseminated to all the outer islands, study participants and local island government leaders. The report launch took place at the Funafuti Lagoon Hotel on 18 July 2018.